If you have two Timed Loops on the diagram, you can ensure that they execute on the same schedule relative to each other. For example, you can configure loop A to execute first and generate data. You then can configure loop B to process that data when an iteration of loop A finishes. To ensure that both loops use the same start time as the basis for their execution, you can synchronize the start time of the Timed Loops. 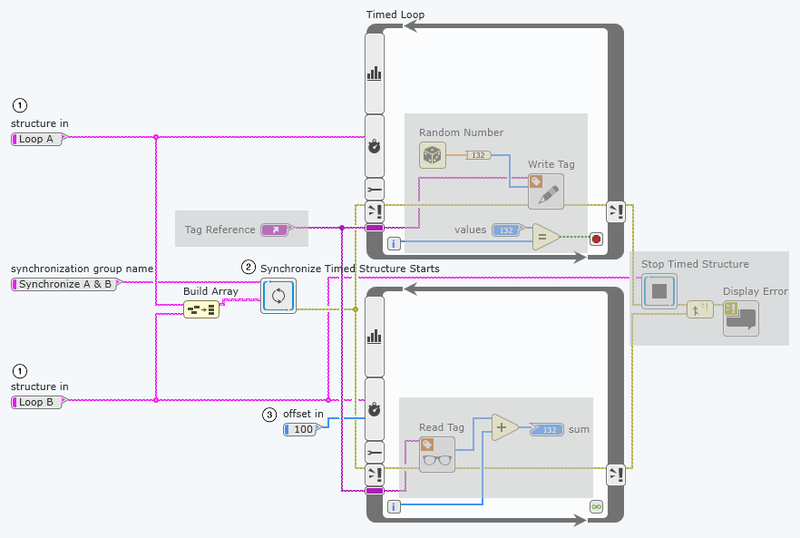 Create the following diagram to synchronize the start of two or more Timed Loops that are executing on a single device. Each Timed Loop that you want to synchronize must have a unique name. Creating a synchronization group using Synchronize Timed Structure Starts specifies which Timed Loops on the diagram you want to synchronize. The synchronization group name can be any string that you want to use to identify a specific group. A synchronization group remains active until the VI completes execution. A Timed Loop cannot belong to more than one synchronization group. Configuring one loop to start a set amount of time after the previous loop ensures that the first loop executes and generates data before the second loop executes. If the start times of your Timed Loops do not align, verify that you did not add one Timed Loop to more than one synchronization group. By default, Synchronize Timed Structure Starts deletes a Timed Loop from its current group and adds it to the group you specify in synchronization group name on the node that executes last. If you set replace to False and a Timed Loop you specify in timed structure names is already a member of another group, the node returns an error to indicate that it could not add the Timed Loop to the synchronization group.